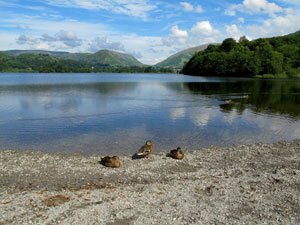 One of the most popular walks in the Lake District! The walk starts from Grasmere and provides a mini Wordsworth tour in the first half of the walk passing by Dove Cottage and Rydal Mount. It leaves Grasmere and follows the old 'Coffin route' to Rydal Mount before heading down to Rydal Water itself. The shores of both Rydal Water and then Grasmere water are walked along before heading back in to Grasmere. This low level walk is ideal for bad weather days or good weather days to enjoy the panoramic views. Early morning walks often provide excellent photographic opportunities of both waters when they are more likely to be flat and provide wonderful reflections. Parking: Stock Lane Car Park (grid reference NY 339 072) - large pay and display car park in Grasmere. Other parking is available in Grasmere.